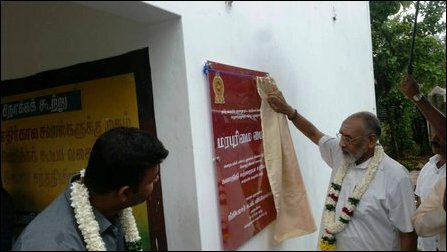 The SL Governor to North Reginald Cooray in November instructed to remove the plaque off the wall of the Tamil Heritage Centre, which had been launched by the democratically elected Northern Provincial Council (NPC) under the former Chief Minister Justice C.V. Wigneswaran in October 2018. The initial set of cultural artefacts that were showcased inside the building have been dumped at an abandoned room of the Teachers Training College at Koappaay. 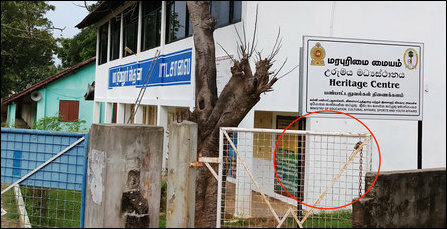 Although the plaque was removed, the board was still standing inside the premises of the Nalloor Stana C.C.T.M School near Muththiraich-chanthi in Jaffna in November. However, this too has been later removed from the locality. The Tamil Heritage Centre has been discarded by the SL Governor to Jaffna Reginald Cooray at the behest of the Sinhala Buddhist monks, an informed academic source at the University of Jaffna told TamilNet. The Centre was launched in a building that belonged to the Provincial Education Ministry. 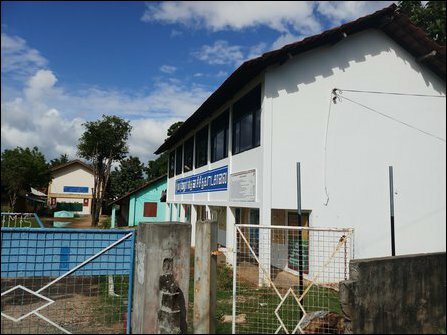 The building is located in the same premises of the Stana C.C.T.M school and was administratively under the domain of the NPC's Education Ministry. The initiative to launch the heritage centre had come from the NPC Education Minister in his cabinet Dr K. Sarveswaran of the EPRLF. Photo taken at the opening ceremony on 18 October 2018 when NPC Chief Minister Justice C.V. Wigneswaran ceremonially declared the opening of the Heritage Centre. The plaque has now been pulled off the wall of the building. 18.10.18 Tamil heritage projects launched as NPC's last-minute manoeu..
30.12.18 Heritage-genocide was motive behind scrapping of T..
17.11.18 SL Governor shuts down Heritage Centre, escalates ..
09.10.18 SL military launches ATMs, postal office in occupi..